I thought that I'd share some pics of various BSG models I've constructed - and a few finished! - over the years. Especially now that Flickr is allowing me to upload images now. 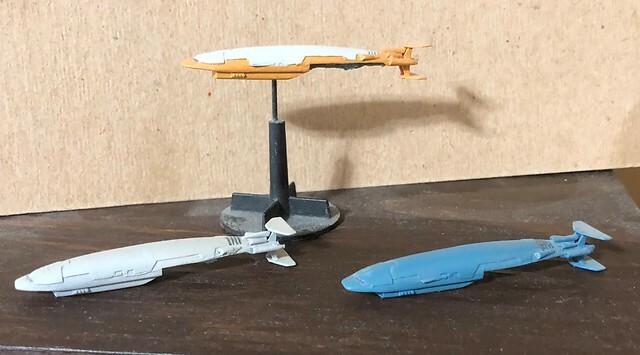 Main BSG Gallery link - Various Ships. Overview of my shelves. 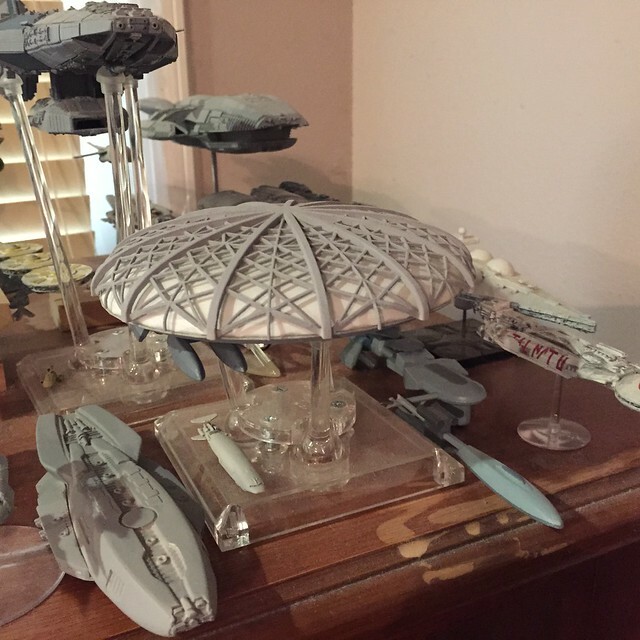 There are two Berzerk-class ships in my collection - neither are from "sithlordyoda" / Burgin. They're both from Fantastic Plastics run of like ten years ago. These are several of my models which won awards at our local clubs IPMS Regional contest. 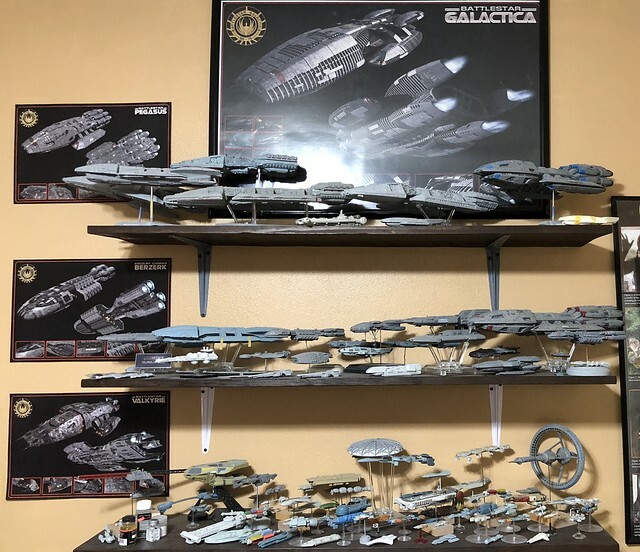 This is everything that I entered, the Battlestar Pegasus was the only single entry, with the others being one entry of multiple subjects - they all won awards. This is the Argus-class gunstar, Eris. She was designed by our very own Aptivaboy and printed via Shapeways. 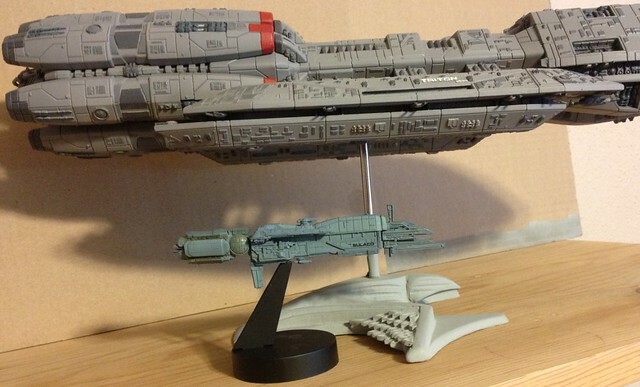 My accurized Moebius Models Battlestar Pegasus build. I scratchbuilt the details on her "arms", as the Moebius kit has nothing on the forward and aft facing sections of the arms. I no longer own her, as she was purchased from me by a collector. Lots of other pics in both albums. Last edited by Griffworks; 03-31-2018 at 05:05 PM. And a few more to show off my "anger issues"! Let's call this "anger management therapy", shall we...? 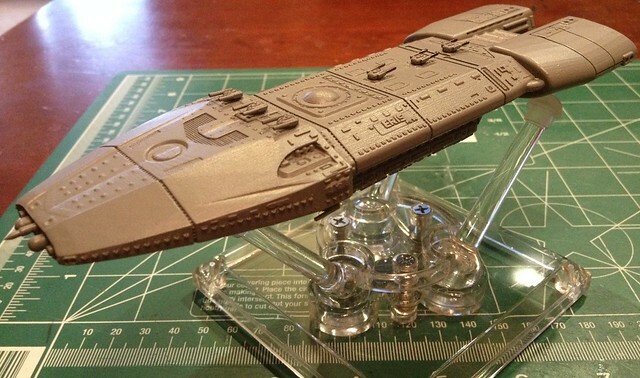 First up is a printed model of the Cloud 9 passenger cruiser from NuBSG. It's an original design by the folks at ZOIC Studios. The album can be found here - Cloud 9 Album on Flickr. 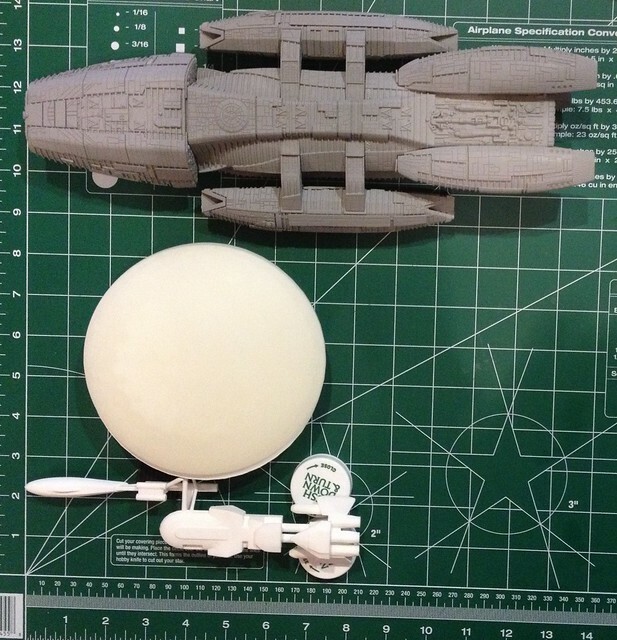 Showing her size next to my build of the up-armored Battlestar Pacifica. I built up an interior in hopes that maybe it could be seen with enough lighting. No such luck. One of the better pics to give an overall idea of what she looks like. Obviously, she still needs a lot of work. 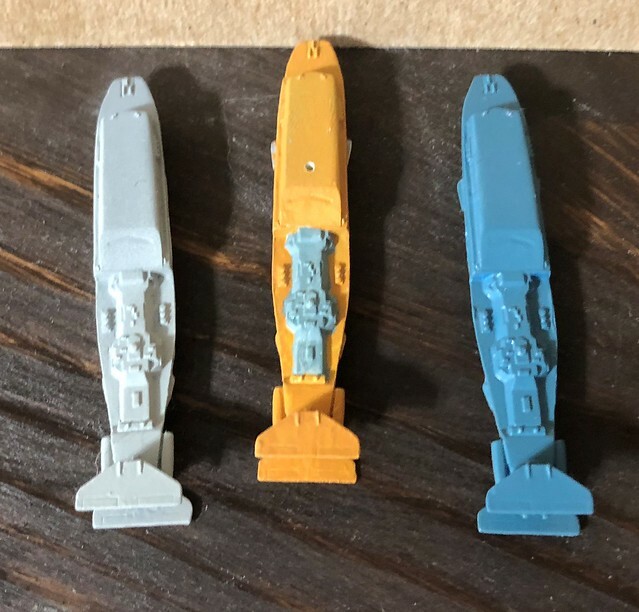 Hephaestus with a couple of shuttles. Last update for today is the Gemenon Traveler-type transport. 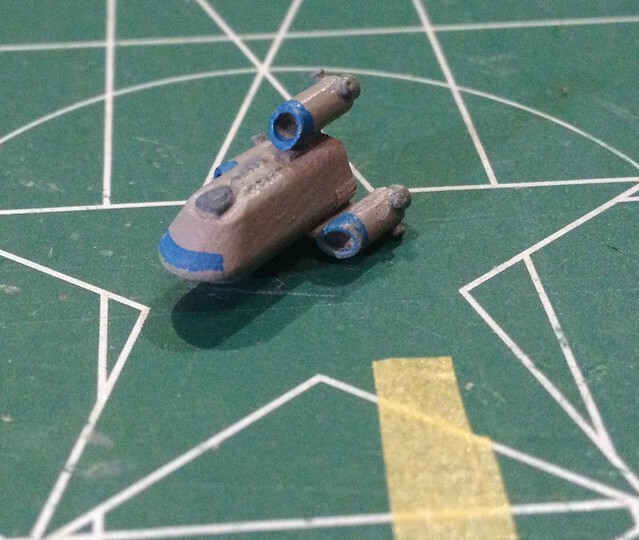 This is a printed model, purchased off Shapeways. More pics in the Album on Flickr. Each one of the squares on that cutting mat is 1" / 2.5cm on a side. Would you mind explaining how, with that fleet, the Colonials lost? So you like BSG then? That is a serious collection of some very cool looking ships you have there. 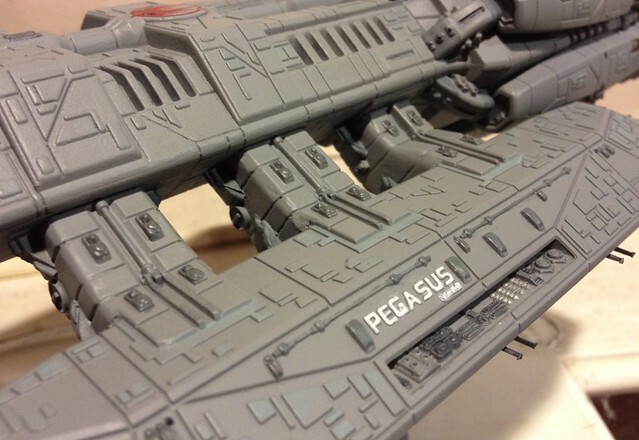 I'm a bit miffed that I missed out on buying some of those arms for the Pegasus - I wouldv'e liked to get some for mine. The Paragrapix set - whilst nice in some areas - sadly lacks credibility for the piece that goes over the joins on the arms. It looks too much like a stuck on piece. Yeah, I wish I had done that on the arms of mine. Even scratching something to make them beefier, but se la dun. I like to think this group went another direction with very few Cylons aboard, and they were - mostly - sussed out pretty quickly. Yeah, sorry to hear you didn't get any of those. 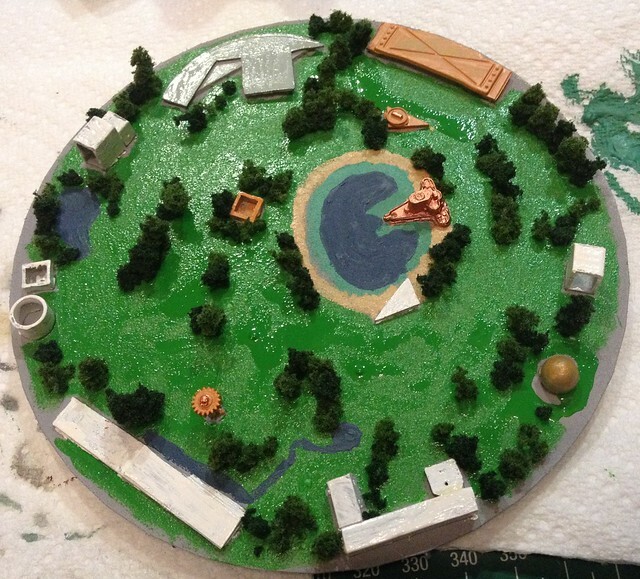 You can do what I did with my Pegasus build, tho, and scratchbuild the area over the joins. 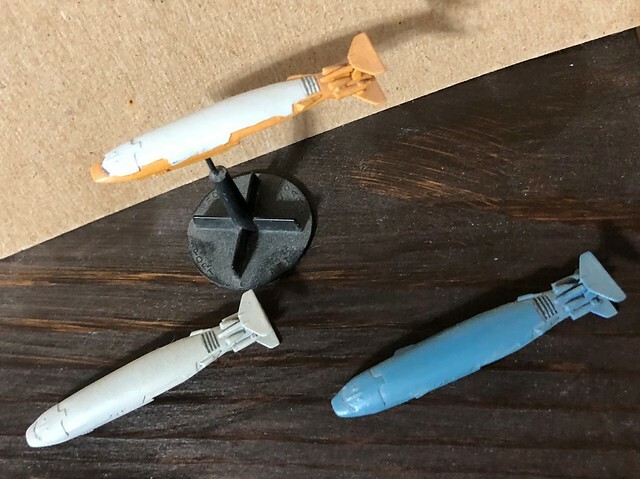 I used laminated sheet stock, some rod stock, and a few bits/pieces from the scrounge box, then scribed in the panel lines. It wasn't a quick process, but I think it was far more satisfying than using the resin arms. Here's my attempt to up-armor a NuBSG battlestar of the Jupiter-class battlestars (same type as Galactica). I named her Pacifica, as I thought that would be a nice way to use up some of my ParaGrafix Model Systems photoetch name plates. Plus, I always liked that name. Name plate added, as well as the inserts for the cutouts where the flight pods retract to. 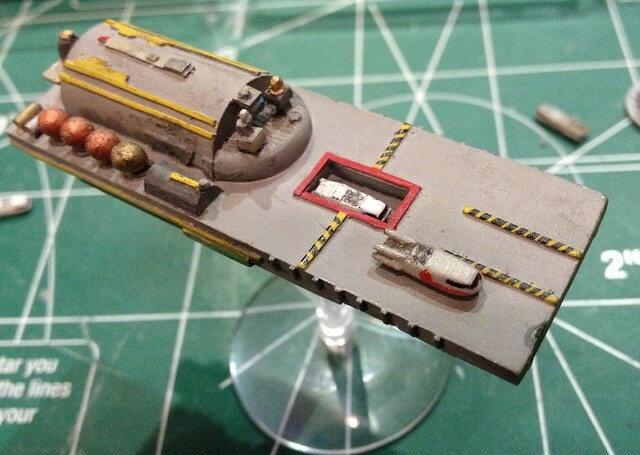 I added in some of the missing AAA emplacements, as well as missile ports. Lots more pics of a bunch of other ships to come. Back with another update! Sorry, it's been a long, not terribly fun weekend. Altho, I've got tons of pics of 80+ models, so plenty more to come. 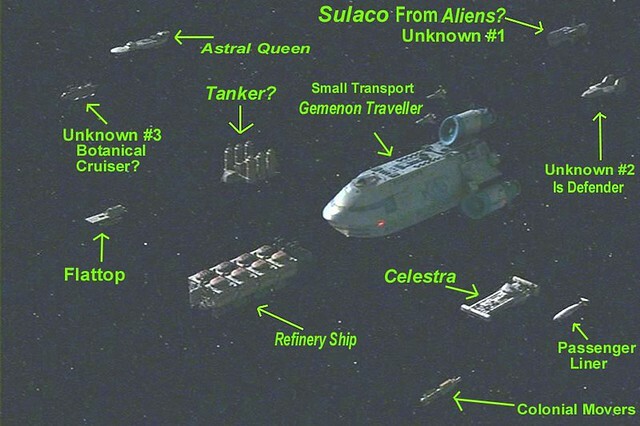 A lot of folk don't know this, but there were a bunch of Easter Egg ships that were a part of the RagTag Fugitive Fleet in NuBSG. 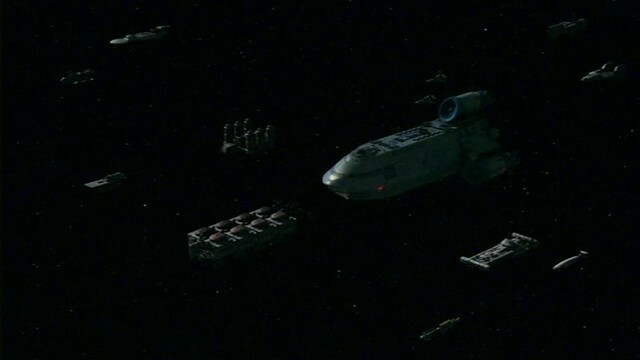 One of those was the USS Sulaco from the movie ALIENS. The first time that we get a really decent view of her is the Season One episode "Flesh & Bone" (107). It's not the last time, tho. The view we see in the episode. Enhanced by bring the lighting variances up. Annotations are mine. 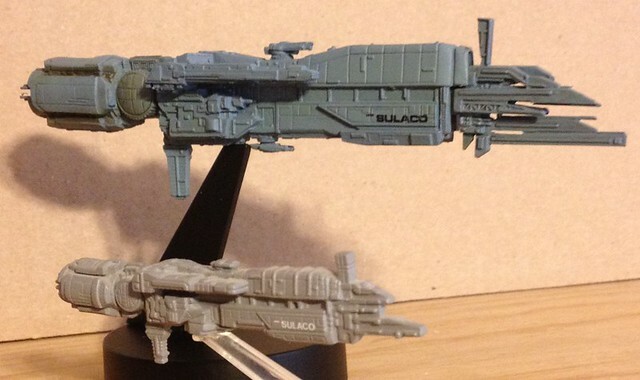 This is the Konami "toy" of the Sulaco. It's 5" / 13cm long and, as you can see. very nicely detailed. In formation with the battlestar Triton. Next to the old MicroMachine from the ALIENS set, which also included the Dropship and APC - and which is extremely rare. More pics in the Flickr album. More pics in the Passenger Liner Album on Flickr.